I am a Juniorprofessor at Technische Universität Berlin heading the Information Theory and Applications Group. Before joining Technische Universität Berlin, I was a Postdoctoral Research Fellow in the Department of Electrical Engineering at Princeton University in the group of Prof. H. Vincent Poor. I was a research and teaching assistant at Technische Universität Berlin and Technische Universität München. In 2012, I received the Dr.-Ing. 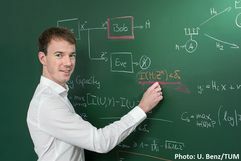 degree in electrical engineering from the Technische Universität München under the supervision of Prof. Holger Boche.